Where: McCamish Pavilion | Atlanta, Ga.
- Notre Dame and Georgia Tech will meet for the 18th time on Tuesday evening. The Yellow Jackets lead the series 10-8. - The Irish are just 1-7 at McCamish Pavilion. - Neither program has posted a double-digit victory since 1989. - Mooney leads the ACC in double-doubles with 10in 18 games (14.0 ppg, 10.7 reb). - Junior T.J. Gibbs ranks second in the ACC for assist/turnover ratio (3.40). - Freshman Prentiss Hubb ranks eighth in the ACC with a 2.03 assist/turnover ratio. - Notre Dame is third in the country in turnovers as the Irish averaged just 9.5 per game. - Gibbs is just 41 points away from reaching 1,000 career points. Notre Dame has struggled to find offense during ACC play and the Irish will face a tough defense in Atlanta on Tuesday night as Georgia Tech only gives up 63.6 points per game. 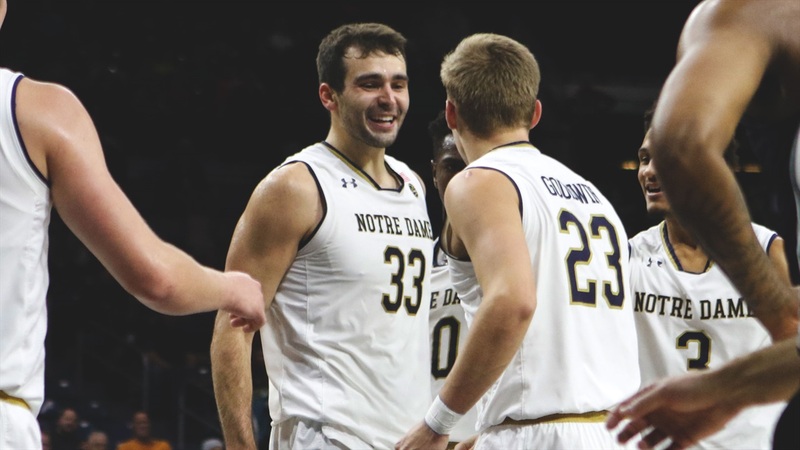 The Irish have found offense in spurts over the course of the last few games but consistency is the next step for Mike Brey’s young squad. Freshman Dane Goodwin broke out of his shell with 17 second half points on Saturday and Brey would love to see the 6-foot-6 guard continue to play aggressively. An aggressive Goodwin gives Notre Dame not only someone who can hit the outside shot, but a guy who can attack the rim. For the Irish get the win in Atlanta, a fast start would be helpful and even give the Irish a short-term confidence boost. Notre Dame shot just 25% from the three-point line against NC State and while the Irish will likely shoot better on Tuesday, it shows how significant the troubles shooting the rock have been. Notre Dame’s defense will catch a huge break as Georgia Tech star Jose Alvarado is expected to miss the game with a groin injury. The sophomore guard is averaging 13.7 points, 3.7 rebounds and 3.2 assists per game. Georgia Tech isn’t a great rebounding team, so the Irish should be in a good position on the glass as John Mooney is rebounding at an incredible clip during ACC play. Notre Dame will need to be aggressive on the offensive glass as it can create a few more possessions and help out a struggling offense. If Notre Dame wins the boards, three-pointers and DJ Harvey scores more than 12 points, I have a feeling the Irish come back to South Bend with its second ACC win.